We are praying for you and your family to be blessed during this Thanksgiving season. We are giving thanks to God for the opportunity to serve the Lord in the Internet Ministry at BibleResources.org. 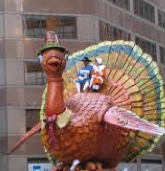 We are most grateful to be able to communicate with so many people around the world and you are among them. We want you to know how much we appreciate your love, prayers and support over the years. We pray for you as well. We give praise to God that He has called us to serve Him through Christ Unlimited Ministries which is a literature ministry on the BibleResources.org website. We have received so many testimonies of how the Lord has used a Bible answer or a daily devotional to change someone’s life. The Bible answers bring understanding to the many questions that our teens and others have today. The Lord also continues to use our article on “What Does the Bible Say about Suicide?” to literally save lives by preventing people from killing themselves after reading it. The current military stats state that every 18 hours a vet commits suicide. It is an epidemic in the military. Bud, upon checking the Bible Resources stats, reported that the number of people who read that article comes to an average of over 800 a month. We thank God for the power of God’s Word and Spirit on this article on the site that conquers death by bringing life to someone who is being attacked by suicidal thoughts. Here is another testimony of a life saved. I have to tell you that the very words written on your website that say “The pain of losing a loved one who took their own life is not easily healed and often isn’t fully healed until Heaven” saved my life tonight. I was going to take my own life but I love my earthly father so much that I wouldn’t want him to suffer pain until he died and went to heaven because of me. I have a 6 month old daughter and loving husband who I would leave, sadly. But the above line, on your website, has made me realize the pain my loving father would go through until his dying day, has kept me from killing myself right now. Your website HAS SAVED MY LIFE. Christ Unlimited Ministries is now presenting 10 books written by Betty Miller that are now available in Kindle versions. Kindle versions include our ever popular daily devotional, God’s Wisdom for Daily Living and the Overcoming Life Series books which include: Prove All Things, The True God, The Will of God, Keys to the Kingdom, Exposing Satan’s Devices, Healing of the Spirit Soul and Body, Neither Male Nor Female, Extremes or Balance, and Pathway into the Overcoming Life. All of the Overcoming Life Series have Bible Study Workbooks available as well and the workbooks can only be purchased in the printed versions in our online Ministry Bookstore. Check your Kindle Reader for these titles or listings under the author’s name, Betty Miller, or you may also go to Amazon Books and check out books by Betty Miller. Amazon donates 0.5% of the purchase price to Christ Unlimited Ministries. 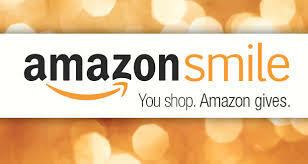 Bookmark the link https://smile.amazon.com/ch/75-1481165 and support us every time you shop. 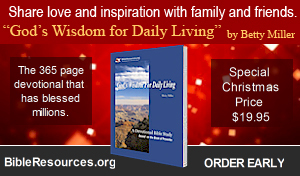 Share love and inspiration with your family and friends by giving the Daily Devotional book by Betty Miller, “God’s Wisdom for Daily Living.” The 365 page devotional that has blessed millions is now being offered at a special Christmas price of $19.95 each. Our latest projects that are almost complete will be the offer of a free devotional mobile app and our launching of the online video ministry on the website. Pray that the Lord will send us the right person to do this IT work plus a videographer. We never dreamed these projects would take so long to complete. Delays occurred as we have had physical attacks on our team members. Cindy Vanderhaar, our prayer ministry director, still needs prayer as she is recovering from surgery for a brain tumor. Our head IT guy, Andy, was diagnosed with Lupus, hence the devotional app was delayed. Please pray for these dear friends for their complete recovery. Without boring you with all the other various attacks that have curtailed our efforts, we hope to soon announce these completed projects on our website. We are in the final stages of completing the Overcoming Life Series in Spanish. Please check the website, as we will soon post these on the website. We have had so many requests for a downloadable version of the God’s Wisdom for Daily Living devotional and we will now be able to offer it as well. Please pray with us as we press to finalize these projects. They are all very near finalization. Pray for our staff, family and team members as we labor together to complete these projects. God has graciously added our granddaughter, Courtney Gould and her husband, Ronnie and their girls, to our Christ Unlimited family. Janice Fritsch, our office manager is a faithful worker as well. They are all committed to helping us get the Overcoming Life message out to the world. We are able to do these things because of your prayers and support. Thank you from the bottom of our hearts! Would you consider continuing to support us financially, or begin to do so, in order that we can communicate with you more frequently and reach out in a greater way? We have always walked by faith in regard to the provision we need in the ministry and will continue to do so. There are other ways you can help us as well. We need your daily prayers for us. That is our number one need. You can also help by sharing with others about the Bible Resources we offer on the website. Letting your church and Bible Study Group know about the website will increase our outreach. Also, we would appreciate you “Liking Us” on Facebook. Also, if you have read any of our books you could help by making a positive comment on Amazon about them.